New information has surfaced regarding the upcoming v 2.0 patch of Total Miner: Forge, straight from the developer’s forum diary. Apparently there will be many changes coming with the new update, and the most appealing of which are listed in a convenient and informative post within the devblog diary. Check below for a list of added features that may or may not be included in the new version. These features are taken right from Greenstone Game’s Total Miner v2.0 Dev Diary. Both v1.0 and v1.1 have basic memory management. Basic in the sense that the game just loads up everything and never unloads. As we all now know, this is not good enough. Players are getting Out of Memory exceptions.The graphics take up most of the memory by far. This is the area we will focus on to reduce the games memory footprint. v1.1 was a little bit smarter than v1.0 in Dig Deep. v1.1 unloaded the bottom lava layer if the player was above depth 1800. This reduces the footprint by about 15 – 20 mb. But it’s still not enough. Furnaces now light up when fueled. The game now no longer loads all graphics in the background. It now only loads graphics when a player moves into that area. Areas of the map that use a significant amount of memory for the graphics are now remembered, and unloaded when players are no longer in that area.We can still get smarter than this, but as it is now, the memory footprint has been reduced significantly and indications are positive. There is no Peaceful on Survival mode. A number of unlockables have been added to the game. Each unlockable is unlocked by performing certain tasks on certain game modes and difficulty settings.Like achievements. Since XBLIG’s don’t have real gamer score achievements, we decided to reward your skill, persistence and foolish bravery by unlocking various avatars that you can play with.Once an unlockable is unlocked, it is unlocked across all worlds and game modes, for that gamertag. You can change your avatar at any time during a game using the menu below (if it’s unlocked). Rename World and Copy World bugs fixed. When copying, it crashes after the copy has completed, so if you restart, you should see the copied world in the list aswell. There is a workaround with the rename bug in v1.1. Just make sure you load a world first, any world it doesn’t matter, then quit back to the world list and the rename will now work. Bluescreen: DrawUserIndexPrimitves -> MapRenderer.DrawMapChunks. Fixed. New Difficulty on Dig Deep – Legendary: No shops on initial spawn. Damage taken from Falls and Mobs is higher. No blueprint finder. No Map. You cannot change difficulty. Locked Chests: These chests will be locked to the gamertag that places them. Only that gamer can open/break them. In MP, if a guest places a locked chest, the host cannot open it, but the host can break it. It should be noted that the list itself isn’t final, and the features listed herein may be subject to change. The list itself will be updated as new features are planned, and we’ll be sure to keep you informed when new information comes to light. Haven’t picked Total Miner: Forge up yet? Find it on the XBLIG Marketplace here or click the picture link below. 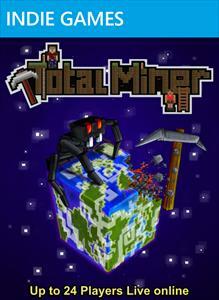 For more information on Total Miner: Forge be sure to visit the official website and stay updated via the forums.